Triggering a hard slab avalanche is still our primary concern in the backcountry despite the quiet weather. It has been over two weeks since the last snowfall event and four days since the last human triggered avalanche; yet with the hard-pack surface conditions, there haven't been many folks out lately testing the slopes. Hiding under the snow surface are weak layers in the snowpack that just will not go away. However, with time they are becoming more and more difficult to trigger, trending toward unlikely. Hence, we are in a low probability, high consequence situation. The tricky part about this is, the pack appears to be stable but the chance remains for an unmanageable and destructive avalanche if a person hits just the wrong spot. To recap, the weak layers in question were formed back in January. They are facets sitting on a slick melt/freeze crust at the mid elevations and facets mixed with buried surface hoar at the upper elevations. The slab on top is 2-4' thick and very hard due to a strong Northwest wind event that ended last Thursday. This wind event caused unusual loading patterns avalanches could be triggered in unexpected places for those with a lot of familiarity of the area. With sunny skies forecast later this week and partly cloudy skies today and tomorrow, there is little in the way of weather that will impact our old and tired snowpack - except for the sun. We can't forget that spring is here; even though temperatures have been relatively cool, this could change any day now. Many folks are taking advantage of the snow conditions by long tours and exploring. If this is the case, know that triggering a slab from the flats below a slope is possible. Being aware of runout zones and considering how far an avalanche could send debris should be in the forefront of our minds. Additionally, no obvious signs of instability may be present before a slope releases and it may be the 10th skier or snowmachiner onto a slope that finds a trigger point. Goat Mountain and Goat Couloir pictured below with some old debris down the main chute. There is also what could be newer debris from last weekend coming from steep rocky terrain out of sight on the looker's right. Springtime is here and as rocks warm with the sun, wet loose and wet slab avalanches should be on our radar. We don't want to be in the path of even a small wet slide. 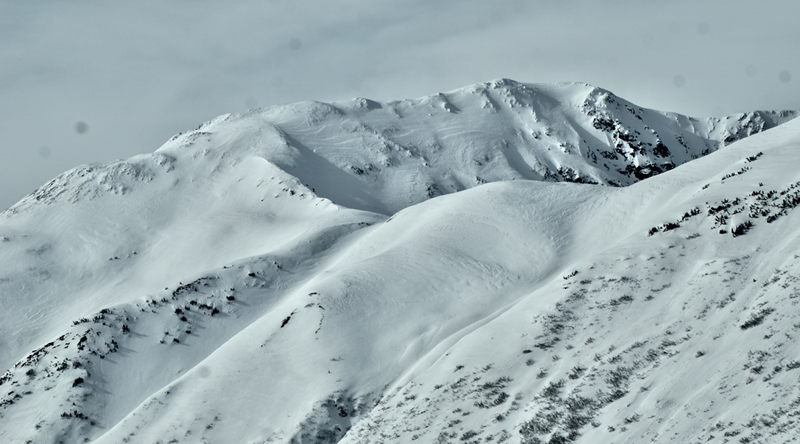 Seattle Ridge - this Southeast facing terrain (that faces the Seward Hwy) is one of the first areas to have wet avalanches during the onset of the spring warm-up. So far the snow remains cold and crusty, but this could change quickly if sun and warm temperatures arrive this week. Wind Slabs: Old hard wind slabs are sitting on a variety of aspects due to prior unusual loading patterns. Watch of these slabs to possibly pull out in steep rocky terrain where slabs are unsupported from below. This type of terrain (steep unsupported slope) is also suspect for triggering a deeper slab mentioned above. Wind effect on the Seattle Ridge headwall. Note the cross loading above the rocks on the slope in the back, this is an example of loading on 'unsupported' slopes. Partly cloudy to overcast skies were over the region yesterday. Ridgetop winds were moderate from the East (15-20mph) before decreasing to light and variable overnight. Temperatures hovered near 20F along ridgetops and warmed to the low 30'sF at 1,000' with daytime warming before cooling into the mid 20's overnight. Today, Tuesday, partly cloudy skies are on tap. It's one of those days where the sun could shine more than expected before thicker clouds move in overnight. Ridgetop winds will be generally light from a Westerly direction (5-10mph). Temperatures look to remain near 20F along ridgetops and could warm to the mid 20's with daytime warming. Valley bottom temperatures are in the teens this morning and should warm to the low 30'sF. Wednesday morning, cloudy skies with a chance for a few flurries are expected as we sit on the outskirts of a low-pressure system rotating in the Bering. By Wednesday evening through the rest of the week, high pressure builds in bringing sunny skies. So far, the winds associated with the clear skies look to remain light and Northerly.